On June 30, 2000, President Bill Clinton signed the Electronic Signatures in Global and National Commerce Act (ESIGN Act) into law without a pen. Instead, he used an electronic signature. 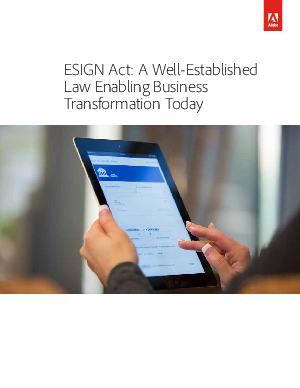 This ground-breaking law addresses e-signatures as well as electronic records, both of which are commonly used in commerce today. Download now to discover the benefits of adopting a reputable e-signature solution.